Chinese New Year reunion dinner is always the center of the whole celebration because of its significance where family members from far and near returned home to have a meal together. Reunion dinners are mostly had at home. However, these days, many opt to have it at restaurants for the convenience as cooking for a large group of people can be very taxing. It is not easy handling the multiple dishes and to ensure that they are all served warm at the same time. So, if you want to have the best reunion dinner menu and warm food served all at the same time, do read on. Before we get into the strategy, it is best to understand the kind of dishes that are served on this important day. Every dish served is symbolic and linked to prosperity, good health and good luck. While the focus may be on the dish itself, what is more important are the ingredients that are used in the dishes. It is commonly a play of word. For example, having fish is a must as the pronunciation of fish in Chinese (‘Yu’) sounds similar to the word surplus. Hence, having a whole fish to begin the year signifies the start of a new year with surplus and abundance. Yes, it is indeed important to serve the fish whole with its head and tail intact and it must remained so even after eating to symbolize completeness. In Malaysia and Singapore, many practiced the Southern Chinese tradition to eat only the body of the fish, leaving the head and tail behind. Interestingly, the fish should not be turned over when eating as the action symbolizes a boat being overturned. Below is a list of the more famous ingredients with their symbolic meanings. Chicken Prosperity, joy and togetherness of a family. Serve as a whole to signify completeness. Prawns Happiness. The Cantonese word for prawn is ‘ha’ (虾) and in Mandarin, it is pronounced as ‘xia’. These words sound like laughter. Lotus seeds Wealth and many (male) offspring. Noodles Served uncut for longevity. Oranges Wealth, fortune and happiness. Lotus root Abundance, wealth and fortune. Dumplings Prosperity as it is shaped like an ancient coin, gold ingot. Glutinous Rice Cake Surpass. In Chinese, it is called ‘nin gou’, which literally means 'high year'. Hoping that each year's achievements surpass that of the year before. Which dish to cook first? You definitely need to start early. That is the key if you are planning to serve dumplings. They can be prepared weeks in advance as dumplings can be frozen. Fried crackers which are found in prosperity toss (yu sheng) can be fried in advance and kept in air-tight containers for at least two weeks. A day before the dinner: Prepare ingredients by cutting vegetables and meat. Keep them refrigerated to be used on the day of the dinner. Tasks such as chopping onions, garlic and ginger should be done on this day. Onions would not turn poisonous if kept overnight. Additionally, cold desserts should be prepared and kept refrigerated. Other steps such as marinating and shaping ingredients (e.g. glutinous rice balls) should also be done on this day. On the day of the dinner: Begin cooking the dishes that takes the longest cooking time. It would be better if you have at least a two elements cook top. Of course, having more elements would definitely be better. How to keep dishes warm? Dishes which are fried and stir-fried do not need to be reheated as they are cooked shortly before dinner begins. That being said, there are two things you can do to keep the food warm. Utilizing the oven, place plates and bowls for the dishes into it. Turn on the oven to heat at 40 degrees Celsius. This will ensure that the plates and bowls are warm when they are ready for plating. If you prefer, dishes which are stir-fried and fried can also be placed in the warm oven until they are ready to be served. The dishes served in Malaysia and Singapore are slightly different compared to other Asian counterparts. For starters, yu sheng is a must in meals during Chinese New Year. 'Yu Sheng', also known as prosperity toss is said to have been created and popularized in Malaysia and Singapore. Unlike in China, dumplings are not common during Chinese New year meals but are often associated with ‘dim sum’. In Malaysia and Singapore, local favourites are usually added to the dishes. Here is a sample menu as a guide. 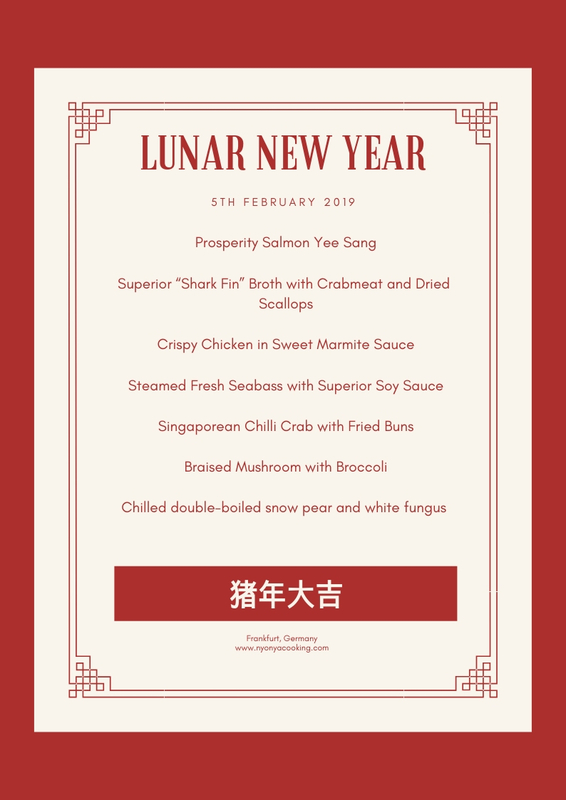 In fact, this is my 2019 dinner menu! (Dinner will be on the first day of Chinese New Year instead of New Year's eve because we are having guests over.) You can find all the recipes on the website. Just use the search tool for the recipes. 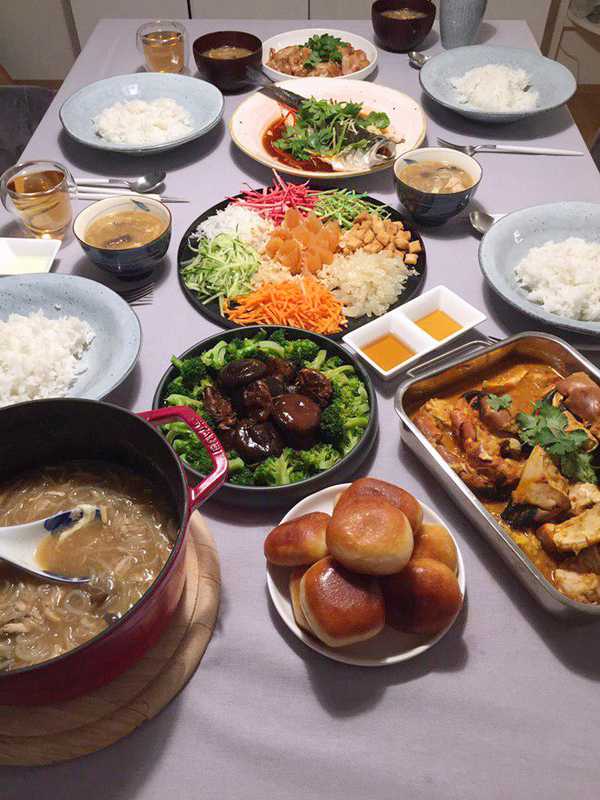 What is most important during a Chinese New Year reunion dinner? Personally, the dishes do not really matter. The time spent together as a family is most important and meaningful. There was one year where my family and I decided to have our reunion dinner at a mamak eatery instead of having a Chinese meal. We enjoyed roti canai and nasi lemak. Till this day, I still fondly remember the experience. Just enjoy any dishes you desire with your family and do not stress yourself on this happy occasion. Hope this guide will help in your dinner preparation. Wishing you a successful time in the kitchen. May the year of the golden pig brings you great health and lots of happiness. Gong Xi Fa Cai!